There are many Pearland pest control companies, but most deal with extermination of insects. We deal strictly with wild animals, such as raccoon, skunk, opossum, and more. The Critter Squad Inc. differs from the average Pearland exterminator business because we are licensed and insured experts, and deal only with animals. We are not merely trappers, but full-services nuisance wildlife control operators, offering advanced solutions. Pearland wildlife species include raccoons, opossums, squirrels, rats, skunks several species of snakes and bats, and more. Many animals can cause considerable damage to a house, not to mention contamination. We offer repairs of animal entry points and biohazard cleanup and we guarantee our work. Our Pearland rodent (rat and mouse) control is superior to other pest management companies. All of our wildlife trapping is done in a humane manner. Of course, we are properly Texas state licensed. We are highly experienced in Pearland raccoon removal, squirrel removal, bat control, and more. We at The Critter Squad Inc. believe we are the best Pearland trappers of wildlife, and would be happy to serve your Pearland bat removal or pigeon and bird control needs with a professional solution. Skunks, moles, and other animals that can damage your lawn - we trap them all. 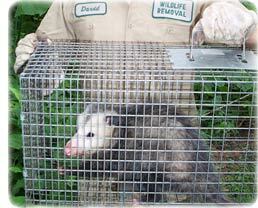 Our professional pest management of wildlife and animals can solve all of your Pearland critter removal needs. 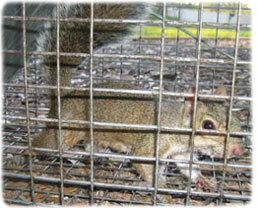 Our specialty is removal of animals in homes such as raccoons in the attic or squirrels in the attic. If you need Pearland pigeon control, Canada geese or other bird removal, we can help. We are experts with skunk problems, digging animals such as armadillos, & groundhogs, and we offer Texas dead animal removal. We trap mice and voles. We do home repairs, animal prevention, and removal of critters from the attic, ceiling, basement, animal in the wall, and any part of a building. Give us a call at 832-772-4486 for a price quote and more information. Remember, we at The Critter Squad Inc. run a wildlife removal company, and charge for our services. If you are searching for help with a dog or cat issue, you need to call your local Brazoria County animal control or SPCA. They can assist you with problems such as a dangerous dog, stray cats, lost pets, etc. There is no free service in Brazoria County that provides assistance with wild animals. There are many creatures that rustle throughout the eaves of trees, scavenging for food and avoiding ground-restricted predators. They skip and scamper, glide and flit through the tops of trees and from branch to branch, seemingly without a care in the world. This presumption is far from accurate, though animals do not have the same cares that humans possess. You won't see a squirrel having a panic attack on a tree branch because it forgot to pay its power bill, but you might witness a fervid possum trying to find shelter before the snow falls. Motives like this are what prompt these lofty critters to crash inside the nearest attic from time to time, and it's especially unfortunate when the attic is yours. Why Are There Animals In My Attic? The truth is, any type of critter can wriggle its way into your attic. It does not matter whether they normally reside in trees or not; the attic is a refuge that even a snake will attempt to take advantage of. As it turns out, attics are secure, dry, warm, and rarely visited by the human inhabitants, which makes them a luxurious penthouse suit for the family of squirrels that want to move in. This infestation typically occurs because animals have been forced to reconcile survival with utilizing otherwise foreign environments. When your roof has a small hole or there's a board torn up on the end, animals are quick to take advantage of that resource. They love the idea of being safe from predators with easy access to food and shelter from the elements. What Kind of Animals Might Be Living in My Attic? While virtually any animal could end up as your new roommate who skimps on rent, there are a few different types that tend to be more likely culprits. Squirrels and raccoons, for instance, are much craftier about finding entryways. If there are loose bits on the roof, holes on the sides, or even a rotten cracked region, these guys will scramble, tear, and gnaw until they have arrived inside. If you have vents, then your attic is certainly not safe from these nimble and clever animals. Rats are also a huge threat, especially since they carry disease and often spread to other parts of the house. Their rodent cousin, mice, can also cause some serious problems within the average attic. No current news article at this time. If you need Pearland raccoon removal, rat trapping, squirrel removal, or have any questions about a wildlife problem in Pearland, please give The Critter Squad Inc. a call at 832-772-4486, and we will listen to your problem, give you a price quote, and schedule an appointment, usually same day or next day, to solve the problem.